Big Futures Foundation may change this policy occasionally by updating this page. You should check this page from time to time to ensure you are happy with any changes. This policy is effective from August 2018. Records or data from third party organisations who work with us to deliver our programmes and you have consented for us to request and collect information from and for them to share that information with Big Futures Foundation. We need to collect this data to ensure your safety while participating in sessions run by Big Futures Foundation, and also for the safety of others around you. 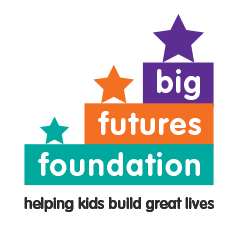 To fulfil grant funders requirements for Big Futures Foundation to show how effective our programmes are for participants. We will only contact you according to your contact preferences, and will only use your data for the purposes it was collected for. Administration purposes such as internal record keeping. This is to enable Big Futures Foundation to fulfil obligations to report back to funders regarding the number of people engaged with the project, participant demographics including the geographical areas participants come from and the benefits of our programmes to the participants. For programme participants any information or data you consent to give may be included in published documents or shared with grant funders but all information and data will be anonymised. This will protect your and your child’s confidentiality and identity. From time to time, we may also use your information to contact you for market research purposes. We will only contact you according to your contact preferences. Under the General Data Protection Regulation (GDPR) that came into effect on 25th May 2018, we must have your consent to contact you, collect, store and use your personal information. An email was sent out in April 2018 to ask current contacts (trustees, email list contacts, volunteers, event attendees) to give their consent regarding contact preferences through an opt-in form which is available to complete online or in paper format. From May 25th 2018, all new contacts (trustees, email list contacts, volunteers, event attendees, programme participants) will be asked to give their consent regarding contact preferences and data sharing through an opt-in form as part of their initial registration, either online through the website or via a paper form. This ‘opt-in’ consent will let you decide when and by which communication channels we contact you and for programme participants what data we can request from other organisations working with Big Futures Foundation to deliver our programmes and what data they can share with Big Futures Foundation. We are committed to ensuring your information is secure. In order to prevent unauthorised access or disclosure we have put in place suitable physical, electronic and managerial procedures to safeguard and secure the information we collect. All personal information and data is stored securely on a password protected server, and on a password protected CRM database. The date consent was given, how consent was given (i.e. via email, on application form etc) and which member of staff processed the consent will be recorded. The password protected server is located in a locked office within Big Futures Foundation main office at 19 Chestnut Avenue, York, YO31 1BR. The server is backed up in a secure location off site. Where consent is not given to store any personal information or data, all records will be deleted/destroyed. This includes all paper records (eg. enrolment, consent and feedback forms and any data collected from third party organisations working with Big Futures Foundation to deliver our programmes) and electronic records (eg. excel spreadsheet, CRM database and any email history). Where consent is not given to store a certain type of personal information (i.e. email address or phone number) or data, all records containing this information or data will be deleted/destroyed. This includes all paper records (eg. enrolment, consent and feedback forms and any data collected from third party organisations working with Big Futures Foundation to deliver our programmes) and electronic records (eg. excel spreadsheet, CRM database and any email history). For programme participants consent will be renewed at least every 12 months from the date of initial consent. For all other categories of contact consent will be renewed every two years from the date of initial consent. For programme participants personal information and data will be stored for two years from the date of initial consent. In cases where funders require us to keep project participant details for a longer length of time, consent to do so will be gained from participants. For all other contacts data will be kept for one year from the end of your last volunteer session or event attended. We will not sell, distribute or lease your personal information to third parties unless we have your permission, are required to send it to relevant funders, or are required by law to do so. You may request details of personal information and data which we hold about you or your child under the GDPR. A small fee may be payable. If you would like a copy of the information held on you please write to Big Futures Foundation, 19 Chestnut Avenue, York, YO31 1BR, United Kingdom. If you would like Big Futures Foundation to remove and destroy all information and data we hold on you or your child please write to us at the above address to let us know.